Playful and Girly! Wear alone or layer multiple together for a Boho arm party! 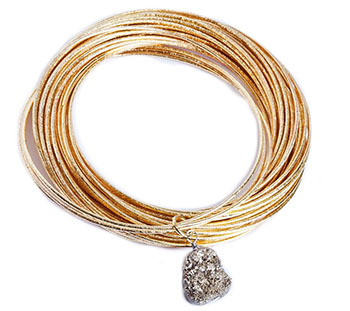 Made with love in the USA of Druzy Crystal Stone, 14K Filled Gold Plate or Sterling Silver Plate. Hand designed by Tammy. Made with love of Swarovski Crystal, and Mixed Metal. Made with love of Austrian crystals, Semi-Precious Stones, Czech Glass, Silk, 14K Filled Gold.